More and more we’re being asked to design the perfect Master Bedroom for our clients. With so many different ideas as to what comprises “the perfect” bedroom, I thought I would share a few key design strategies I use to build personal bedroom interiors for my clients. 1.) I love to start with incredible bedding. My go-to references for bedding are www.easternaccents.com and www.ralphlaurenhome.com. Bedding sets the tone for everything from the color scheme, to the overall theme of the space. Chances are, if you don’t like you’re bedding, or if it just doesn’t work anymore…nothing else you do to the room will even matter. That being said…choose wisely. The strength of the color and pattern of your bedding will absolutely define the interior. So, if you’re looking to design the ultimate oasis…go find your visual beach…even if it’s lined with plaid. 2.) Consider ALL of the ways you might use the room when selecting furniture. More and more, we’re seeing bedrooms turn into mini suites. Consider everything from your storage needs…to comfortable seating designed to decompress your body and soul. And remember, furniture is really just stylish storage…so try to introduce elements that are different from your main living space. Take a risk in the bedroom…those usually payoff. 3.) View your bedroom lighting and lamps as functional art and accessories. Listen, no surprise here. Forgettable lighting makes a bedroom just that. So, ditch the safe hotel lighting, and let’s look for elements that support your design theme, excite the eye and inspire you to get away. www.curreyandcompany.com is a can’t miss resource! 5.) Look for the “it” visual moment in the bedroom. Typically, this is the wall above the headboard…so this area really needs your complete design attention. Think big. Think statement. Think great headboard. Don’t have the funds for a killer headboard? Not to worry, try accenting that space with paint, wallpaper or even personal photography. Treating this area with a special kind of decorating dignity can make or break the overall design of the bedroom. Just few thoughts today. 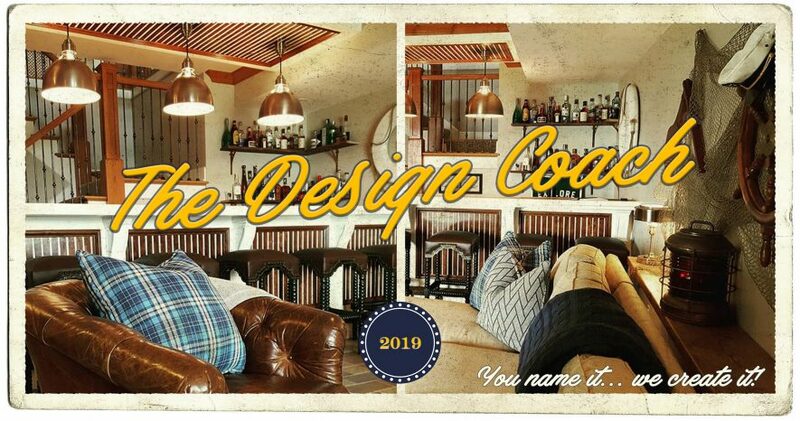 For more on this topic, including our thoughts on “media in the bedroom”, “to footboard or not to footboard”, and the ever popular “how many pillows is too many pillows”…check out the link below to The Design Coach Radio Program: Building the Bedroom. Ever since I was a boy, say age 10 or 11, my surroundings mattered to me. My bedroom, the source of lasting memories for any child, was shared with three brothers. And depending on the arrangement, it felt a bit like a dorm room. But I always had my quadrant, and enjoyed inventing elaborate themed environments that reflected my current interests. I remember my history phase, where I would build and suspend WW II model airplanes from the drop ceiling. Then came the introduction of the Space Shuttle, and I was obsessed. Various science posters, pictures, articles and magazine covers were taped to my walls like a cheap version of a museum display. And of course, always in the mix, were the images and game schedules of my sports heroes. Sweetness (Walter Payton #34), may you rest in peace. I trace my love for creating spaces directly to that bedroom, as it signals the beginning of a long and fruitful creative journey I am still on to this day. In the daily routine and chaos of running a design firm…the smaller details of the experience can sometimes fog the bigger picture. 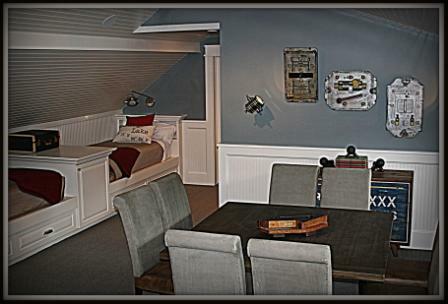 However, recently I had the opportunity to work on two very different and special projects; a minor bedroom makeover and a lake house bunkroom. Both projects gave me a renewed appreciation for my work, and are prime examples of why interiors matter. Let’s start with the Master Bedroom. My wife and I had the opportunity to help with a friend who had lost her husband to cancer. It had been almost a year since she was able to sleep in her own bed, settling most nights for either another room in the house or a couch. Finally feeling as though it might be time to begin moving forward, she decided it was time to reinvent the bedroom she had once shared with her husband. After discussing the project with our friend, my wife reached out to me to see what we could do. Eager to help, we started with selecting a new paint color for the walls, something a bit brighter that might reflect a new perspective. We unanimously settled on a soft, muted lime green. And in conjunction with the wall color, came a recommendation for new bedding…a sophisticated floral featuring washed raspberry, lime green and pale yellow accent. The selections were a bit of a departure from her typical design preferences, but my wife encouraged her to pick something she loved…regardless of her previous design direction. Solid advice from my wife, who typically gives me sound and honest counsel. The minute we removed the bedding from its packaging the gravity of the moment hit me. For our friend, this was obviously so much more than a quick bedroom makeover…it signified the start of a new life…a rebirth. The bedroom project had become a symbol of her amazing poise and perseverance. My wife and I were not only grateful that we had shared that with her, but we were so encouraged by her optimistic spirit and determination to rebuild her life for both her and her son. I guess I was just struck by the enormity of this small design gesture. The lake house bunkroom was an all together different experience. It was a wonderful project that called me to craft an environment that reflected a collaborative interpretation of a summer surrounded by friends. When I first devised my design strategy for the interior, I recall saying that the space had to have a nautical spirit without too many of the obvious elements…and that it had to appear timeless while at the same time nostalgic. I think what I loved most about the project, was that the very nature of a bunkroom was that it’s meant to share and be shared. So with that in mind, I set out to craft an interior that would inspire the soul, nourish the eye and create lasting memories. From the materials selections in support of the build-out, to the bedding selections and accent elements, the team and I worked hard to make sure the space was comfortable and not over designed…but detailed with enough big moments that would make an impression and set a tone. We used subtle backdrops of khaki and crisp white, combined with bolder accents of red and nautical blue. Not a new thought for a lake house, but it was how we used the colors to balance the space that inevitably made the difference. The lighting selections were classic and nostalgic in appearance…with the flair only brushed chrome can deliver. We mixed textures and orchestrated wood finishes that felt both traveled and familiar. 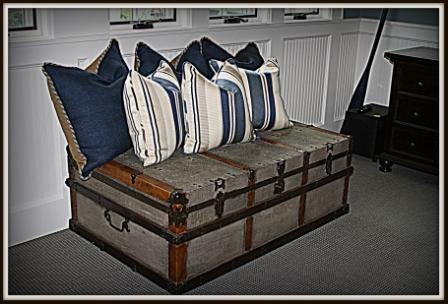 Finally, we added the important finishing details (Reclaimed oars, vintage luggage, baskets and books), and found object art work (Machine mold forms, and framed flour/grain sacks) that had an industrial and decidedly patriotic overtone. I feel so fortunate to work on spaces like these because they represent one of many reasons why I got into the design business. I wanted to build spaces that were meant to be shared, and specifically crafted to communicate that when you’re here…you’re some place special. Perhaps during this project I was channeling the creative 11 year-old of my youth. Who believed, and still believes our interiors are just one big piece of performance art. Hopefully, like my childhood bedroom, the bunkroom creates memories that will be with the family forever. And you never know, maybe the design will spark something in another young artist who will begin a creative journey of their own.